A new report on trends in house prices in Britain has just been released by Savilles. According to its annual "Valuing Britain" analysis, "The total value of the UK's housing stock has risen slightly to £5 trillion over the past year, but housing wealth is becoming increasingly concentrated in London and the South East." "Ten years ago the UK's housing stock was worth just £2.9 trillion, rising to £5.4 trillion at the peak of the market in 2007. However, the UK total value remains -6.4 per cent below peak, though London's residential real estate is now worth 14.2 per cent more than in 2007, having risen by 6.8 per cent over the past year alone. At the other extreme, Northern Ireland's stock is worth £72 billion, having fallen -10.2 per cent in the past year." "property wealth continues to be more and more polarised between North and South, and between different tenures. "Just ten London boroughs - Westminster, Kensington & Chelsea, Wandsworth, Barnet, Camden, Richmond, Ealing, Bromley, Hammersmith & Fulham and Lambeth - have an aggregate value equivalent to the total value of Scotland, Wales and Northern Ireland combined at just over £550 billion. Even within London, wealth is increasingly focused in core central and high value boroughs. The richest borough - the City of Westminster - has just 121,600 units, with a total value of £95 billion, more than twice the value of Edinburgh and almost three times that of Bristol. "And beyond the capital the analysis highlights some pockets of very concentrated housing wealth. For example, the high value commuter hotspot of Elmbridge in Surrey (which includes Cobham, Esher and Weybridge) has a housing stock value of £31 billion, more than that of Glasgow (£29bn), while that of Windsor and Maidenhead (£23bn) is slightly more than that of Cardiff." 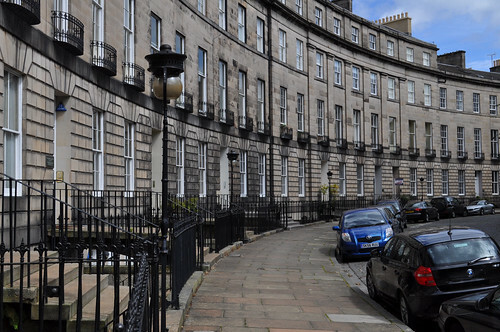 Obviously flats in Belgravia will generally be large and luxurious, but then so are many in the posher parts of Edinburgh (above). Properties in Cardiff will tend to be smaller and basic, but these differences do not account for the regional variations, which are almost entirely due to land value. In places such as the outskirts of cities such as Sunderland, the rental value of the land must be little more than that of the surrounding agricultural land. That this must be so can be deduced from the fact that current rental values for houses and flats in these marginal locations is just enough to cover the cost of maintenance and a return on the actual value of the bricks and mortar. One of the conclusions to be drawn is that if Council Tax is to be replaced by a tax based on land values, it cannot possibly remain as a local tax, since a given rate of tax in, say, Sunderland, would raise a tiny fraction of the amount the same rate of tax would yield in salubrious Sunningdale. The same point, in fact, applies to any tax, including the present Council Tax or a Local Income Tax, widely presented as a "fair" tax since it would be based on "ability to pay". The fact is that hardly anyone in Sunderland has the ability to pay enough tax to fund the local council, whereas few of the residents in Sunningdale would have difficulty in forking out the necessary cash.